We are one of the largest acetylene gas plant manufacturers engaged in fabricating and exporting top quality acetylene gas plant with a capacity of 50m3/hour. 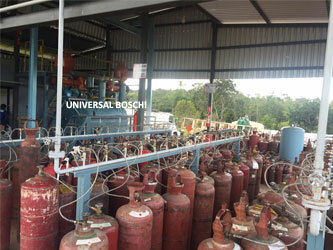 Our business is known for making acetylene gas systems with the best modern technology. The plants are equipped with ultra modern digital systems and other features making the machine efficient and easy to operate. Being fully automated the plant can be operated by a single operator. We use stainless steel in the fabrication to ensure efficiency, strength and durability. All our manufacturing processes comply with internationally approved standards like ISO 9008:2015 and CE. Acetylene gas is a widely used industrial gas. It is identified as a colorless and highly flammable gas having a garlic-like odor. Being the most efficient of all fuel gases, it is much in demand in steel plants for oxy-acetylene gas cutting, welding and flame cutting. Industries prefer using acetylene gas plants for generation of on-site gas. Apart from producing high quality acetylene, our plants are explosion-free and fairly priced. Acetylene is able to generate superb heating with minimum thermal waste. And, it uses extremely low percentage of oxygen increasing its efficiency. Acetone is mixed with the gas to stop decomposition. While the reaction is taking place between calcium carbide and water, considerable of heat is generated that needs to be moderated to avoid explosions which is efficiently done in our acetylene gas plants. Calcium carbide is powdered in a pulverizer and then it is reacted with water. 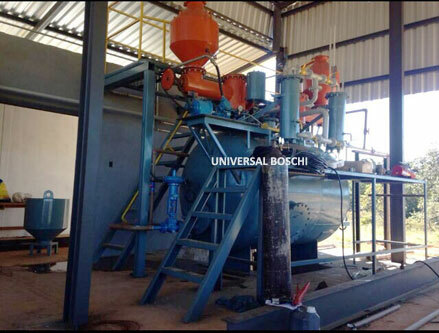 Then, powdered calcium carbide is added through a gas hopper valve to the acetylene gas generator which has sufficient amount of water to discharge lime slurry comprising of 85 % to 90 % water. The temperature is kept below 90 deg C and the pressure pegged at 2 atm. Our acetylene gas plants with a capacity of 50m3/hour ideally meet the requirements of small scale industries. Being built with the latest technology and superb designing, our acetylene system will efficiently handle all your requirements of the fuel gas as you can generate as much of it as you want. And, you can store for contingencies as well. You will have guaranteed supply of the gas 24*7. Having an acetylene plant installed onsite; you can remain assured that your manufacturing will not suffer because of supply issues. 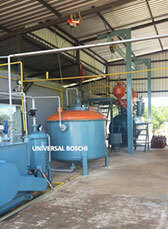 The acetylene system comes equipped with cylinder refilling and storage equipment. Our acetylene systems are trusted for high efficiency, reliability and precision of functioning. Manufactured with high quality materials, the system is durable and delivers world-class performance year on year with considerably low maintenance and operating costs. A single operator without specialized technical knowledge can run the plant machinery because of its complete automation and digital systems. We recommend that you replace compressors and filter components regularly to keep them in top working condition. Compliance with strict safety standards is mandatory for industries using acetylene gas in their manufacturing processes. Being highly flammable, acetylene gas is likely to cause hazards if safety standards are not followed strictly. It is strongly advised that that acetylene gas is transported, stored and handled exactly as per the safety standards and measures approved internationally. Non-compliance with standards can result in accidents. On using acetylene cylinders you must take all safety precaution for safe working. Running an industrial gas business is lucrative though it is capital-intensive. Upon purchasing an acetylene plant from us, your cost will be squared off in 2 years. Thereafter, you will be in profit for a long time as it will keep generating revenue for your business. Purchasing an acetylene gas system makes sense if you are small to medium scale business as getting acetylene supplies is not so reliable as producing your own and is a lot cheaper. Acetylene gas is used for other applications as well such as for making plastics and chemicals. It also finds application in organic synthesis and chemical synthesis. Super-E® explosion proof motors have NEMA Premium® efficiency. No drip cover.